What is a livestock operation? In the 2011 Census of Agriculture, more than 85,000 livestock farms were reported, representing 41.6% of all farms in Canada. In 2010, livestock farms reported total gross receipts of $24.4 billion and incurred $21.0 billion in operating expenses. For each dollar of gross receipts, livestock farms incurred 86 cents in operating expenses, e.g. feed, livestock, veterinary services and wages. This issue of Canadian Agriculture at a Glance presents an analysis of the expenses that have taken up much of the operating budget. This article also shows variations in expenses between provinces and by industry type. In addition, it compares expenses by production method, namely livestock farms with crops and livestock farms without crops. In 2010, the average amount spent on feed purchases by Canadian livestock farms overall was 27 cents per dollar spent (Chart 1), an increase of 4 cents per dollar spent, or 17.4%, compared with 2005. The amount spent on livestock purchases by these operations was 21 cents per dollar of expenses, a decrease of 1 cent, or 4.5%, compared with 2005. Feed and livestock expenses alone accounted for nearly half of each dollar spent. In 2010, the amount spent on wages and benefits for livestock farm workers was 8 cents per dollar of expenses, the same proportion as in 2005. Interest expenses went down by 1 cent per dollar spent, from 6 cents to 5 cents per dollar spent, between 2005 and 2010. In the 2006 and 2011 censuses, feed purchases were the largest expense for livestock farms in all provinces except Alberta. In 2010, animal feed expenses varied from 21 cents to 40 cents per dollar spent, with a national average of 27 cents per dollar spent (Chart 2). In 2005, these expenses varied from 17 cents to 36 cents per dollar spent, with a national average of 23 cents per dollar spent. The average amount spent on feed purchases by livestock farms in Newfoundland and Labrador in 2010 was 40 cents per dollar of expenses. 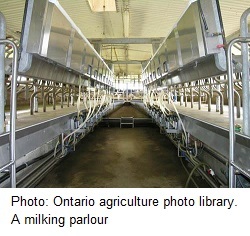 The cost of feed purchases for the dairy industry, which is the largest farm industry in the province in terms of total receipts, was 40 cents per dollar spent, while the national average was 21 cents per dollar spent. 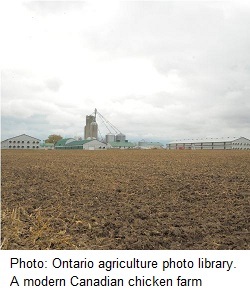 It is possible that cool summer weather in that province affects forage production. By contrast, the amount spent on feed purchases in Saskatchewan and Alberta in 2010 was 21 cents and 23 cents per dollar of expenses, respectively. The beef cattle industry recorded one of the lowest ratios of spending for feed purchases, which explains the low cost incurred for this expense in these two provinces. 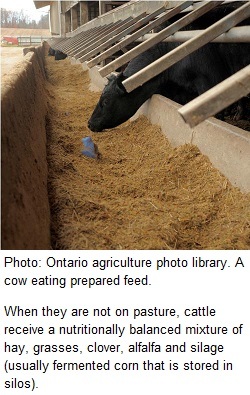 Manitoba recorded the greatest absolute variation between 2005 and 2010, with spending on animal feed increasing 5 cents per dollar of expenses. The hog sector, the largest livestock industry in the province, is largely responsible for the increase. The average amount spent on feed purchases in 2010 by Canadian livestock farms without cropsNote 2 was 37 cents per dollar of operating expenses, 12 cents more than the amount spent by farms with crops (Chart 3). As well, livestock farms without crops paid 3 cents more per dollar spent for custom work, including custom feeding. It is difficult to compare the two production methods, because the proportion of expenses related to crop farming reduces the proportion related to livestock farming (the relative magnitudes of the expenses change). To make it easier to compare the two production methods, animal-related expenses were reduced to a common denominator using a ratio of feed expenses to livestock expenses (feed/livestock). The ratio may be interpreted as follows: for each dollar spent on livestock purchases, an amount X was spent on feed. Accordingly, for each dollar spent on livestock purchases, livestock farms with crops spent $1.25 on feed purchases, which is approximately 7 cents or 5.4% less compared with livestock farms without crops (Table 1). However, the ratio does not account for the costs associated with growing the crops. This table displays the results of Feed expenses-to-livestock ratios for livestock farms with and without crops Livestock farms without crops, Livestock farms with crops, Difference and Variation, calculated using ratio, $ and % units of measure (appearing as column headers). This section compares livestock farm expenses by industry type. To that end, pure samplesNote 3 were selected for each industry, that is, specialized farms raising only one animal species. Among all the specialized livestock farms, dairy cattle and beef cattle farms spent more per dollar of expenses on crop-related activities (Table 2), since cattle farms usually have greater crop acreage than hog or poultry farms. This table displays the results of Cents per dollar of expenses spent by specialized livestock farms with at least 1 acre of crops. The information is grouped by Expenses (appearing as row headers), Activity type, Livestock Industry, Dairy, Beef, Hog and Poultry, calculated using cents per dollar of expenses units of measure (appearing as column headers). However, dairy cattle and beef cattle farms spent less per dollar on animal feed. In addition to greater crop acreage on cattle farms, polygastric animals (such as dairy cows and beef cattle) can ingest fibres that are cheaper than grains or oilseeds. The dairy industry spent the least on livestock purchases, at 3 cents per dollar of expenses because, in this industry, dairy herds are almost entirely replaced on-farm; dairy production being the result of a reproduction cycle (milking period). Therefore, the costs incurred for livestock purchases were associated mainly with dairy herd breeding. The beef cattle industry incurred the lowest costs for total wages, at 4 cents per dollar spent (Table 3), as a result of access to pasture lands and automated feeding systems in feedlots. This table displays the results of Cents per dollar of expenses spent on wages by specialized livestock farms with at least 1 acre of crops. The information is grouped by Expenses (appearing as row headers), Livestock Industry, Dairy, Beef, Hog and Poultry, calculated using cents per dollar of expenses and ratio units of measure (appearing as column headers). Industries under supply management (dairy and poultry) incurred the highest costs for total wages, at 13 cents and 10 cents per dollar spent, respectively. More specifically, the amount spent by dairy operations on family wages was 8 cents per dollar of expenses, the greatest amount of all specialized livestock farms. The ratio of family wages to non-family wages reveals a different picture with respect to the employment on specialized farms. This ratio can be interpreted as follows: a ratio of 1 means that $1 was paid in family wages for each dollar paid in non-family wages (that is the case in the beef cattle industry). In the dairy, poultry and hog industries, the amount paid in family wages for each dollar paid in non-family wages was $1.6, $0.7 and $0.6 respectively. This overview of operating expenses makes it easier to identify the major expenses of Canadian livestock farms. These expenses vary depending on the province, production method and industry type examined, and on other factors not directly discussed here, such as productivity level, commodity price inflation and weather. This summary analysis makes it possible to compare the movement of expenses for each dollar spent. The main purpose of this look at animal-sector expenses is to show where each cent per dollar of expenses goes with respect to Canadian livestock farms. “Livestock operation” refers to establishments such as ranches, farms and feedlots that are primarily engaged in raising livestock, producing animal products and fattening animals. This grouping is defined on the basis of the North American Industry Classification System (NAICS), 2007. Under NAICS, an establishment falls under the animal sector category if 50% or more of its production comes from animal production. Care must be taken in comparing expenses at multiple points in time. Since the concept of cents per dollar spent is an alternative to the percentage rate, it is the relative size of the expenses that varies. The variations do not necessarily imply that input costs have gone up or down. “Without crops” refers to all farms not reporting any crop acreage for field crops, hay, vegetables, sod, nursery, Christmas trees, fruits, berries and nut production. It also refers to farms without summerfallow land, tame or seeded pasture, natural pasture, woodlands, or wetlands. On the other hand, “with crops” refers to farms reporting at least 1 acre of one of the crops or production methods above. “Pure sample” refers to farms reporting only one animal species in the 2011 Census of Agriculture. For example, the hog farms selected raised only hogs and did not possess any poultry, dairy cows, cattle, sheep or other livestock. Operations having no crop land were excluded, because they were few and therefore not representative of specialized livestock farms. Therefore, the specialized livestock farms that were selected had at least 1 acre of crops.